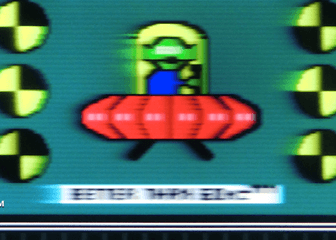 Ever since the Blur Busters Holiday Special article about the Amazing Journey to 1000Hz Displays and the earlier true 480Hz monitor tests, Blur Busters has been paying much more attention to HFR video developments. We are the only website in the world to exclusively talk about “Better Than 60Hz”. This universe also includes 120fps HFR. 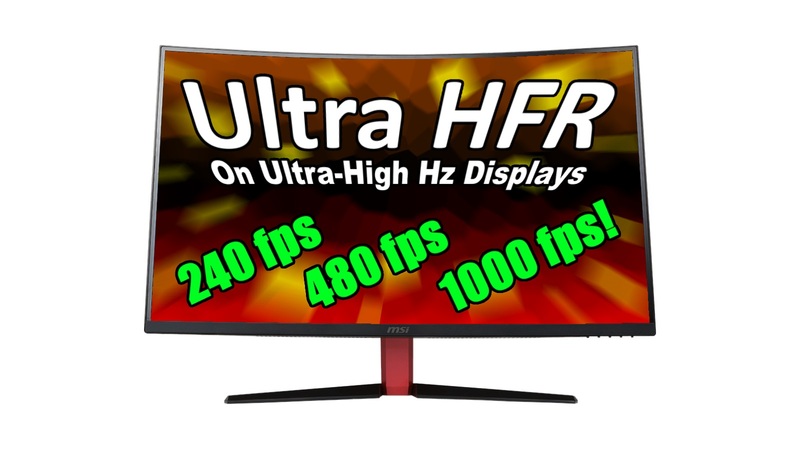 However, there are also experiments with Ultra HFR — the art of displaying video at ultra high frame rates (HFR 240fps, 480fps and 1000fps) in real-time on ultra high refresh rate displays. Not slow motion! Now, we are testing video beyond 120 frames per second! 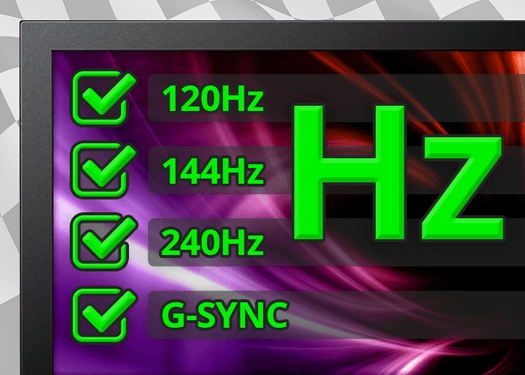 Here is a method of creating 240 frame per second HFR video, for play back on today’s 240 Hz eSports monitor. Get any favourite slo-mo camera capable of 240fps. …From smartphones to GoPros to Phantom Flex cameras, many cameras now can do 240fps. Get a GPU capable of 4K60 playback. 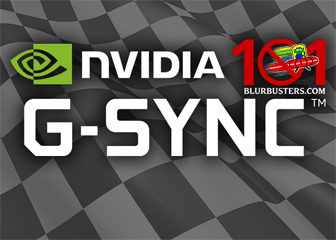 …GPUs capable of 4K 60fps playback are also able to do 1080p 240fps playback. Get a true-240Hz gaming monitor. See List of Best Gaming Monitors. Record video in normal 240fps slo-mo. Resulting file is 30fps. If you need to use a video editor, edit while video is still slo-mo. Then export an .MP4 video. Finally, run this ffmpeg command line to speed up the video back to real-time playback. This speeds up video to play at 8 times the frame rate, converting 30fps to 240fps. Play the video in your player (VLC, MPC-HC, Windows Media, etc) on your 240 Hz display. …You may need to experiment with different video players to find the best 240fps experience. High speed cameras, designed for slo-mo, often do not record audio well. At the moment, the best way to add audio is to record the audio separately, and use a command line utility to dub the audio onto the sped-up file. The same general instructions apply to 480fps and 1000fps HFR, with different speedup factors (replace number “8” with the appropriate speedup factor). 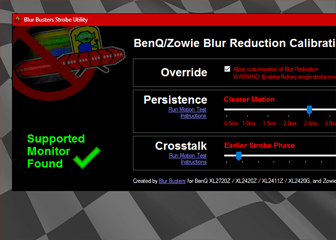 Share your results in the new Blur Busters Forums High Frame Rate (HFR) Video discussion area! 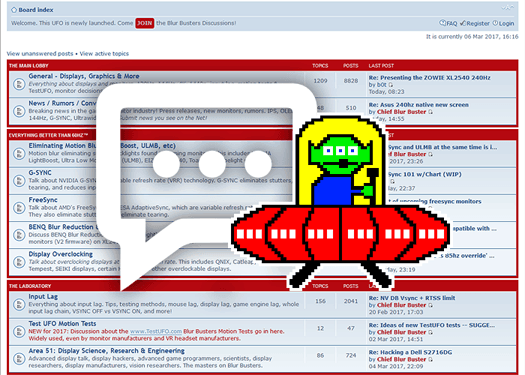 In the newly created Blur Busters HFR Forum, there is a thread worth reading about Ultra HFR. Experimental 1000 Hz displays are already available, and will eventually be cheap within one human generation. Now even some smartphones are also gaining ultra-high frame rate video recording capabilities too. This presents opportunities for cheap Ultra HFR in the coming years! By doing 1000fps HFR on a 1000Hz display, you can simultaneously avoid camera motion blur and avoid display motion blur and avoid stroboscopic effects. Strobless low-persistence (blurless sample-and-hold) without flicker is successfully achieved with 1000 Hz experimental laboratory displays, and is also useful with Ultra HFR video. Time-wise, the difference between 120fps HFR versus 1000fps HFR is roughly as big as the difference between 60fps and 120fps. This is because 1/60sec and 1/120sec is an 8.3ms difference, while the difference between 1/120sec and 1/1000sec is a 7.3ms difference. There is a curve of diminishing points of returns, but the massive jump up to 1000fps HFR greatly compensates. As a result, a large jump up the diminishing curve of returns is required to get as dramatic improvement as the jump between 60fps and 120fps HFR. Therefore we believe that the next step after 120fps HFR should now be 1000fps HFR. Also, UltraHFR benefits higher resolution more. 1000fps UltraHFR would not be nearly as useful for standard-definition video material (less than 1 pixel of motion blur for one-screen-width-per-second motion) but would be hugely beneficial to 8K material (8 pixels of motion blur for one-screen-width-per-second). Display persistence is additive to camera persistence (shutter). A 1/60sec persistence display combined with a 1/60sec shutter video, generates a combined 2/60sec of human-perceived motion blur. As a rule of thumb, your common perceived blur is often at least twice the camera shutter, and often much worse (e.g. 1/1000sec shutter combined with 1/60sec display persistence). This means that on most displays, a 1/1000sec shutter at 60fps only has barely half the motion blur of 1/60sec shutter, simply because it is bottlenecked by 1/60sec display persistence! Also, a display that has a pixel response (GtG) that is a significant percentage of a refresh cycle at its max Hz — will also limit UltraHFR benefits even further. Resolution reduction is a big problem at higher frame rates on current cameras. Recommended is to oversample by recording at about 2x resolution (e.g. true 4K) and then downconvert (e.g. to 1080p). For this reason, it is hugely preferable to get a superior high speed camera (e.g. Phantom Flex 4K) instead of smartphone camera (e.g. 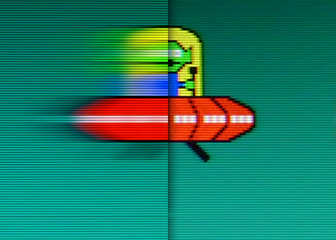 iPhone in Slo-mo) when generating source footage. Lens autofocus is sometimes difficult during filming moving imagery. It is especially amplified when your motion clarity is extremely sharp, to the point where any camera focus issues begin to become visible. Be aware of the vicious cycle effect where higher resolutions demands higher refresh rates to eliminate resolution limitations. The difference between static images and moving images become much more pronounced at 8K than it is for 1080p, since motion blur is time-based (e.g. same amount of blur per inch, affects more pixels on higher DPI displays). This is especially hard because current camera technology often goes lower resolution at higher frame rates. High frame rates benefits high motion material. A great example is sportsfield panning, downhill skiing, BMX racing, car racing, etc. When the first HDTVs arrived, some camera operators reported they had to intentionally slow down panning and operate slightly differently because LCD HDTV blur (of the first flat panel HDTVs) was much worse than old CRT motion clarity. UltraHFR benefits fast motion material very significantly. Many historical frame rate tests about frame rate benefits have often neglected to consider (1) (2) (3) (4) (5) (6) simultaneously. Research indicates that any one of the above can be a weak link in eliminating the benefits of UltraHFR video, and one must carefully control the variables to give truly human-visible benefits of UltraHFR. If you are planning any experiments in UltraHFR, it is very important to know and understand the above variables. 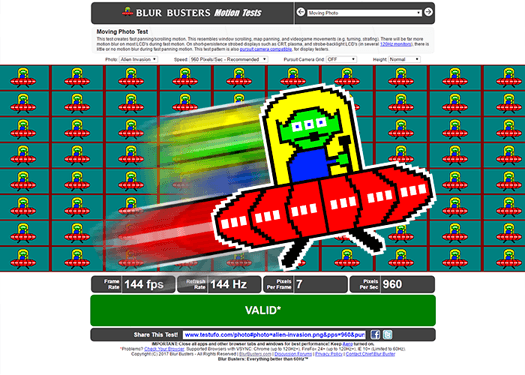 At Blur Busters, we are among the few people in the world to have witnessed Ultra HFR video! We believe this is very useful for many applications in the coming decade, from speciality theatre, virtual reality, amusement park rides, advanced cinema, truly immersive virtual vacations, “Holodeck” video, and other applications once more 1000 Hz displays are commercially available beginning sometime within the next decade and beyond. Great stuff, the problem is the best I’ve been able to get out of YouTube is 120fps — any HFR videos uploaded are downconverted, and so one has to upload 120fps slo-mo videos to YouTube, and then select “2x” YouTube playback speed. So a lot of the 480fps and 960fps information is lost by YouTube if you speed up the videos to realtime HFR rather than slo-mo HFR. So we have to rely on *.mp4 downloads for HFR videos, rather than YouTube which decimates the framerate of non-slo-mo HFR videos. Do you have the original 480fps and 960fps video files on disk? Maybe share them to me, so I can take a look directly at them, to see what can be done for presentation (e.g. on existing 240Hz gaming monitors, and my experimental 480Hz monitor). We tested 540p 480fps on the Zisworks 480Hz display and it works, but only MPV succeeded. None of the other players could properly play 480fps.